In recent years, large-scale `disease-oriented' and `target-oriented' screening procedures have transformed anticancer drug discovery. As a result several novel therapeutic agents and strategies, aimed to combat cancer via a molecular approach, are being evaluated for their possible clinical benefit. The main topics of this volume address the challenges for current drug development and the available preclinical in vivo and in vitro model systems. Special new techniques to mimic the clinical situation in the mouse, models to evaluate metastasis and angiogenesis inhibitors, new molecular targets for anticancer drug development and their preclinically/clinically examined inhibitors or modulators are described. Furthermore, the recent testing procedures for the discovery of novel therapeutic agents employed at the US National Cancer Institute (e.g. Hollow Fiber Assay) and at the European Organization for Research and Treatment of Cancer (EORTC) - Screening and Pharmacology Group (SPG) - are reviewed. 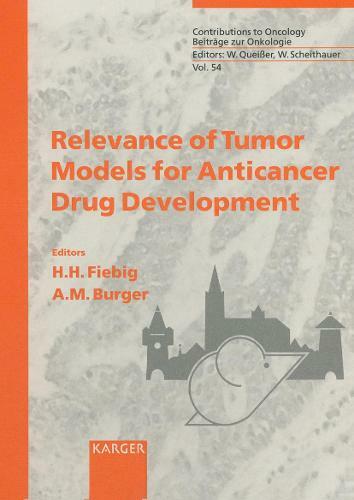 This volume will provide a comprehensive overview of the up-to-date drug discovery and development strategies for medical oncologists, experimental cancer researchers, cancer research institutions, and the pharmaceutical industry.